Get in to the phone booth and dial up some serious blues guitar… It’s the phrasing that might trip you up here, plus those occasional staccato notes… Robert Cray started to play guitar when he lived in Seattle as a child. Seeing the Beatles on TV had influenced him to pick up the instrument in the first place – along with just about every other kid in the neighbourhood. Then his folks moved to Virginia and the young Cray was exposed to soul music for the first time and, after a succession of high school bands, headed off on a rhythm and blues route which launched a very successful career. All this goes a long way towards explaining the pop and soul influence over the Cray blues style – add to this an obvious and self-confessed Albert Collins influence and you’ve covered his stylistic base pretty much completely. The track is from Cray’s Bad Influence album which came out in the early 80s, right at the time when the guitar market was screaming out for an original voice to cut through all the dross in the charts. In fact, Robert’s version of this tune with Albert King was nominated for a Grammy – the first of many nominations and awards that were to come his way. If we’re talking about Robert Cray’s blues guitar style, then it must be noted that heavy gauge strings – .011, .013, .018, .028, .036 and .046 -and a hefty pick must feature in the equation somewhere. It certainly goes a long way to explaining the man’s tone and attack on the instrument. We’d have to consider the fact that Cray’s signature Stratocaster features a rosewood (or pau ferro) fingerboard and manly frets and so, if you’re drawing the conclusion already that this man has his instruments set up for a rough ride, you’d be beginning to get the picture. One of Robert’s ‘signature’ sounds is his use of staccato phrases – a short, sharp, stabbing attack which is brought about by his tendency to lift the string slightly with the pick, sometimes using his fingers to ‘pull’ the strings so that they snap back against the frets in much the same way as a slap bass player would. Stylistic entry points aside, I played the track using a pick and a fairly regular pick attack because I figured that most people will want to play this song the conventional way. The Cray way is available to you, but beware of being too ‘copycat’ in your influences, you should really try to mix everything up to produce an original style if you can. Another reason why I picked this track was the fact that, although it definitely falls into the blues category, its chord arrangement is quite far from the standard blues norm. Take a close look at the chords before you do anything else and notice how much tension is produced by that initial jump from the A minor to the E7#9. Consider too how this will affect any solo over the top – you’re not following the conventional path of root to IV chord and this fact alone will make you phrase differently. Listen to the rhythm guitar; it’s not too far from one of BB King’s type of rumba rhythm patterns. This is something which is seriously overlooked at practically every blues jam I’ve ever been to. If someone calls for a ‘blues in A’ it seems that the good old chunga-chunga shuffle is the rhythmic default, whereas there are many more rhythm styles available. All in all, Phone Booth makes an almost perfect study for anyone wishing to develop their own blues phrasing. You can learn something from virtually every facet of this track and I would advise you to break it down into short sections and really make sure that you understand what’s going on at every turn. 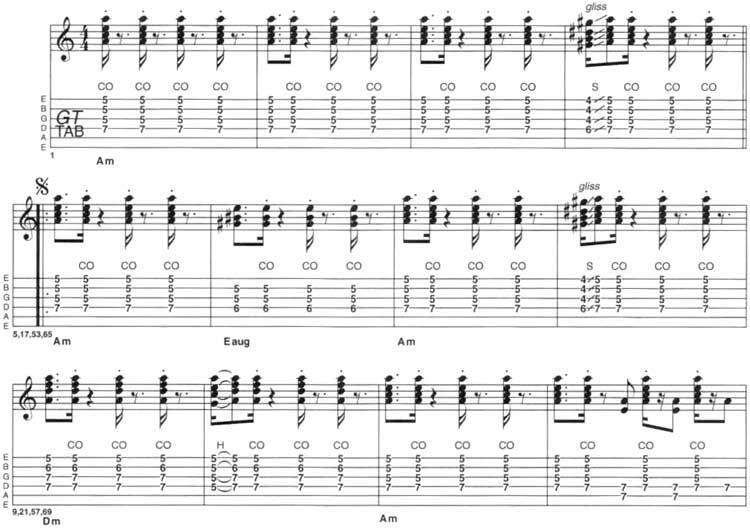 It’s a part of Robert Cray Phone Booth guitar tab and sheet. © 2012 - 2019 TabsClub Powered by TabsClub 42 queries in 0.270 seconds.